Lovebay Dual Head Led Grow Light helps accelerate the growth of indoor plants. Rapidly improve the health of plant and growing, leaves grooming within 2 weeks of using this growing lamp on a daily basis. 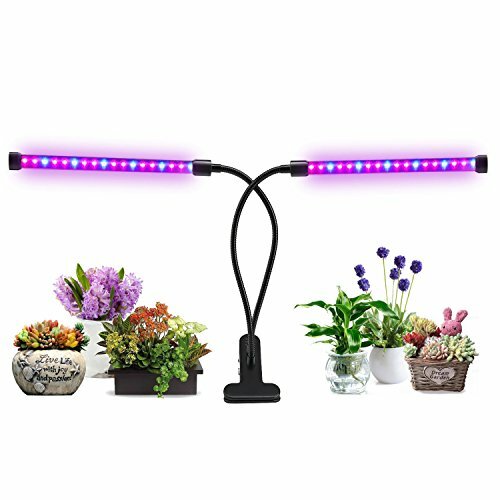 Improve Plant Health and Growth: Lovebay plant grow light gives off targeted wavelengths (460nm and 660nm) lights to help accelerate the growth of indoor plants, foliage plants, flowering plants, succulent plants, potted plants, rapidly promoting leaves and flowers blooming. 36 LED Beads & Dimmable 2 Levels : 36 LED Plant Growing Beads (24 red & 12 blue) .This upgrade version is ultra bright, lower heat and lower power consumption, high luminous efficiency and long service life. You can adjust the brightness of the light according to plant needs.